It’s no secret that the United States has seen a huge boost in consumer spending over the past few years. Not counting inflation, personal consumption spending has gone up 2.9% a year over the past five years. That’s almost double the annual growth from 2010 through 2013, which was about 1.5%. But the health of the consumer is really tested around holiday season. And most of all, during Black Friday weekend. This year, sales were expected to grow around 6% compared to last year, which would be the highest rate since 2011. The data that’s coming in so far is promising. For example, the International Council of Shopping Centers estimates that 151 million people went to a mall or shopping center last weekend. Online sales grew from $5 billion to $6.2 billion, or about 25%, from last year. Expectations were for a whopping 17.3% growth, but even that got shattered. Lastly, Mastercard reported that total sales just on Black Friday were $23 billion, which is 9% higher than last year. It’s amazing that half the country’s population went to buy things in brick-and-mortar stores, yet online sales still grew by over $1 billion. That’s a recipe for growth! And this doesn’t even include Cyber Monday. Retail analysts estimated that a record $7.8 billion would be spent in total on Cyber Monday. However, actual sales beat that expectation as well, exceeding it by about $100 million. The total $7.9 billion spent was almost 20% higher than last year. 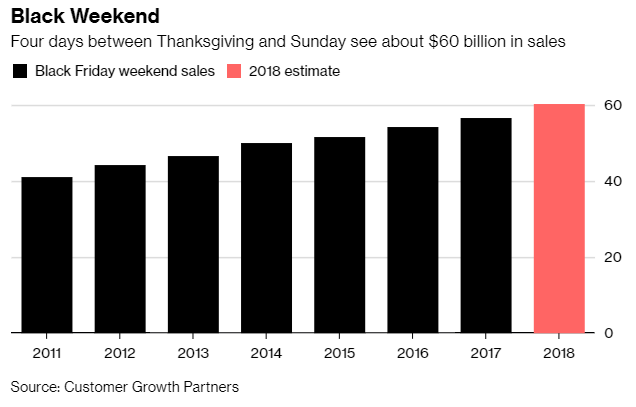 That makes Cyber Monday 2018 the biggest online shopping day of all time for the U.S.
Keep in mind that personal consumption makes up about two-thirds of our economy. So, the fact that expectations continue to be beaten means that the economy is still strong. The pessimism in the stock market right now is mainly driven by fear rather than facts. The reality is that people are working more and making more money. And consequently, consumers continue to drive the economy higher. Will Black Friday Eventually Come to an End?